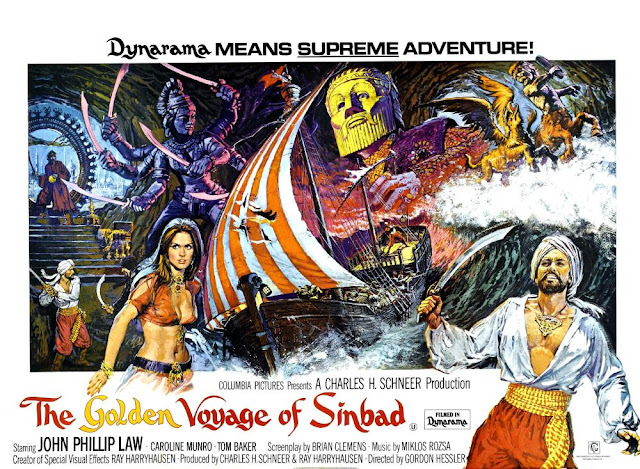 About 15 years after his seventh voyage Sinbad was back for this 1973 film in which he is on the trail of an amulet part of which is serendipitously dropped onto his ship by a gargoyle like bat creature presumably the sort of occurrence that often happened. This odd bit of plotting aside, The Golden Voyage of Sinbad is a tighter more nuanced film than its brash predecessor. Interestingly it holds back on its monsters; whereas Seventh Voyage wheeled out the Cyclops within its first ten minutes, the small winged demon aside, there is not a big beast in sight for over half an hour. This gives the movie a better momentum and more opportunity to establish characters in particular Tom Baker’s mercurial Koura. After obtaining the amulet Sinbad has a vision both of a belly dancing girl (apparently a man according to Caroline Munro in the behind the scenes) with an eye on her hand. She / he moves like Kate Bush years before `Wuthering Heights` and amusingly has to sort of shuffle backwards ungraciously which could have done with another take! A storm that makes some of the crew believe the object has cursed them (to speak like pirates!) takes them to the fabled island of Marabia. Here the Grand Vizier has another piece of what they discern is a map showing the route to the fabled Fountain of Destiny. Each of the three pieces represents a different gift - youth, a shield of darkness and a crown of untold riches. Sinbad accepts the Vizier’s challenge to help find the fountain though after another homunculus has overheard their conversation this becomes a race against Koura. Once they set sail, Koura’s ability to make inanimate objects come alive presents a series of perils. Though following a similar trajectory to its predecessor Golden Voyage is a more robust vessel with each of the fantastic creatures we encounter having a purpose and symbolism. While there’s some mystical mumbo jumbo and air of convenience (it’s never explained why the homunculus happened to be flying over the ship for example) the narrative also builds up an interesting head of steam. The main attraction apart from the monsters is of course Tom Baker in a gift of a role. Koura is established as dangerous from the off- the Vizier’s gold helmet conceals severe burns inflicted by the wizard during a previous attempt to obtain the amulet – yet he is not without other dimensions. In his last major role before becoming a Time Lord, Tom Baker gives excellent villain as Koura’s spells age and weary him something Baker puts across really well. The film makes a lot of this and it pulls Koura from being more than just a standard antagonist into someone much more interesting. Of course Baker’s boggle eyes and deep voice are tailor made for such a role. 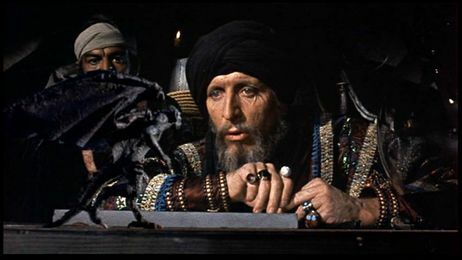 Inevitably Koura is more interesting than Sinbad played by John Phillip Law with an earnestness that seems out of place for such a supposedly gung ho adventurer – a bit of levity might have helped . Mind you it does add to the intensity of his rivalry with Koura and when they clash you get the sense that both actors are taking things seriously. Luckily we see more of the crew this time round and they are a much more relaxed bunch numbering a pre Professionals Martin Shaw amongst their number. Cast as the damsel in distress Margiana (whom nobody calls Marge!) is Caroline Munro barely fitting into a slip of a costume. At least she’s not shrunk and put in a box but gets little to do except be carted off by a Centaur. The film seems more expensive than Seventh Voyage with quite a crowd of extras, a larger crew and ship and a more grand scale. Best of all you can see how Ray Harryhausen’s craft had developed further. The composition between the creatures and the humans is almost seamless allowing for more dynamic sequences. Oddly the first major encounter in which the ship’s masthead figure comes alive to steal a map is not as exciting as it might be, but perhaps the stiff gait of the figure represents the difficulty a distantly located Koura is having manipulating it. 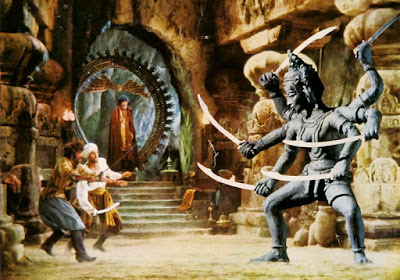 The next encounter with a six armed Kali statue is the film’s best action sequence with an almost seamless join giving the thing a real air od danger. Later there’s a centaur who carries Margiana off for no real reason other than so Sinbad can rescue her but later there’s a battle between the creature and a griffin, symbolic of good versus evil. There’s a real momentum in the final 40 minutes driven by Koura’s resourcefulness at every turn. In the days before CGI could render almost anything, the films of Ray Harryhausen were best at creating monsters that looked good enough to interact with the human characters. They could make a new Sinbad film now and fill it with armies of Centaurs and Cyclops but I wonder if they’d have the same charm? I suspect too that the nature of the character might prohibit the same sort of film; you could hardly have a white American playing him now. As with each film in this three box set, there are some cracking extras including new interviews with Caroline Munro who seemed to have a great time on the film, an audio interview with Ray Harryhausen and a chat with Tom Baker who’s in typically rambunctious form. Few actors can tell an anecdote with as much colour and humour as he can.